When we saw this wall mounted plate rack being manufactured in Richards workshop we knew we had to bring it you you. Watching a true British Craftsman at work is very satisfying, working the wood, shaping it and detailing it to produce an exceptional finished product. The Diana is our showcase product, it’s the one we sell continually. Perhaps its the style, look and feel coupled with the practicality of holding 6 dinner plates, 6 side plates, 6 cups and with plenty of storage for bowls and other items of kitchen crockery. Lovingly crafted from the highest quality Swedish Pine and left in its natural state, ready for you finish and add to your kitchen. 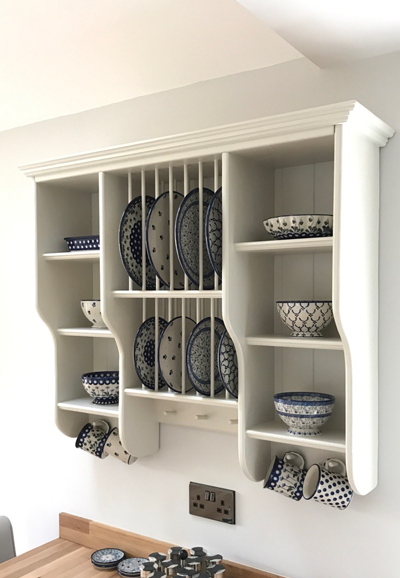 We know you will love having this plate rack in your kitchen, it will add character to your home, be a great talking point and the envy of your friends when they see it. View the Diana Wooden Pine Plate rack today, order it and we will get it to you within 21 days.